BP oil spill: $18.7 billion payout is expected to provide closure for the deadly accident. 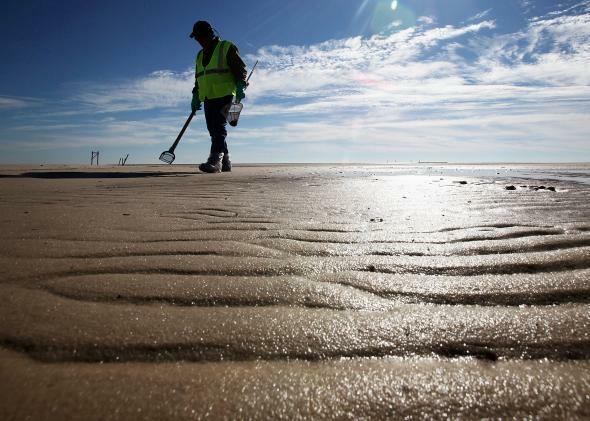 A worker cleans tarballs from the BP oil spill on Waveland beach December 6, 2010 in Waveland, Mississippi. Nearly eight months after the spill, tarballs were still washing up on the beach. BP agreed on Thursday to pay $18.7 billion for damages caused by its oil rig explosion in the Gulf of Mexico in 2010, an accident that resulted in the deaths of 11 people and the largest marine oil spill in history. The settlement covers lawsuits filed by parties including the U.S. government, five U.S. states that were affected by the spill, and several hundred local government organizations. It also includes a civil penalty of $5.5 billion under the U.S. Clean Water Act. The British oil and gas company has agreed to pay out the $18.7 billion over 18 years. This amount, which comes in addition to the hefty sums that BP has already had to pay in legal and clean-up fees over the last few years, is expected to end the majority of BP’s litigation wars over the accident, though the company still faces shareholder lawsuits and some outstanding costs from a 2012 class action settlement. With this new settlement, BP’s total bill for the spill climbs to $53.8 billion—a number that exceeds the company’s profits in the last three years. Carl-Henric Svanberg, BP’s chairman, said in a statement that the agreement offers “a path to closure” for BP and the Gulf. “Five years ago we committed to restore the Gulf economy and environment and we have worked ever since to deliver on that promise,” he said. The effects of the BP spill would not have been as severe if multiple efforts to contain the flow, caused by the April 20, 2010 explosion of the Deepwater Horizon oil rig, had not failed. Because these plans were unsuccessful, a steady stream of crude oil poured into the Gulf of Mexico for 87 days. The months-long spill is estimated to have tossed 210 million gallons of oil into the ocean—so much oil that it was visible from a NASA satellite. Beaches and wetlands in the surrounding areas were wrecked. In 2013, 4.6 million pounds of oily material was removed from the beaches of Louisiana. Clean-up of the spill lasted years after the event, as local areas reported extensive damage to wildlife, marine life, land, and tourism-related industries.